Sorry i didn't find the homepage on the web (offline too). That download is just a link to the file on your A: drive. Do you have an installer for it that you can upload for me? I have WOTGreal v3.005 but I don't understand how to use it and I can't get it to show everything in a map like in your screenshot. I'll keep trying. Navigate to the maps folder and open your map. Press the Class button up top. Yes, I forgot about the WOTgreal approach. Oops, wot greal 3.005 is not the same, it's a very advanced one.. Here is the true link, Download, you can ether export static_mesh to 3ds files, but only from a package, for static-meshs from a map, you'll have to save a package in unrealed under a new name. Too advanced for me. 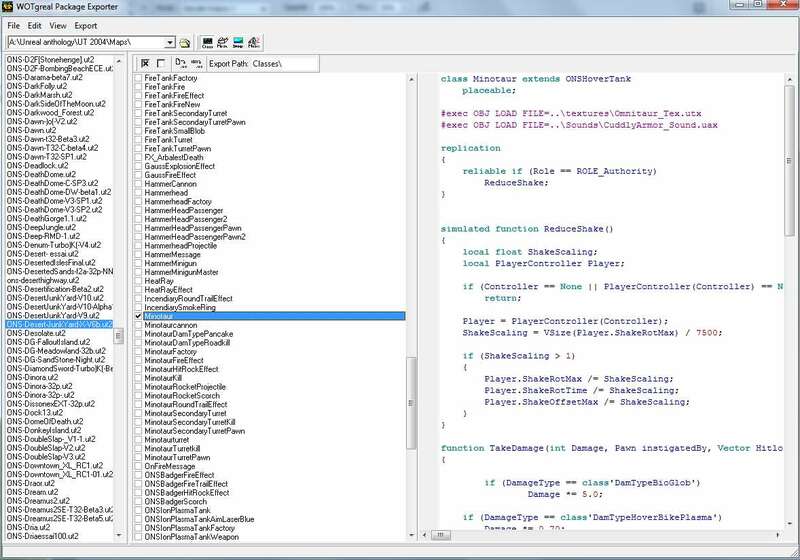 No matter what I do I can only get it to show what I'm guessing is the compiled code for the map. Got it. Thanks. Unfortunately it's not showing anything for that FlyManta map. It doesn't seem to show any stock classes on any maps. The author extended ONSTankFactory with LongRangeONSTankFactory, which is myLeveled, but I can't get that to show in the WOTGreal Exporter. Oh well, no biggy. I just wanted to see the differences in the LongRange verse stock versions of the Goliath. Thanks for the help anyway. Right now I just want to get my vehicle .uc files into one .u file so I can test out changes. I can't figure that out. I think I've reached a dead end. I've tried to include all the files that I thought were relevant to the Goliath but I still get that 'error opening file" message. I don't know how to tell what file that is and I don't know how to tell what all the files are that the Goliath needs. There's no nice, neat dependency tree or anything like that that I can find. I don't even know if what I'm trying is correct but just missing something. My guess is that the next step after importing is trying to open a file it can't open. Maybe something to do with saving. I ran CMD as an admin just in case permissions were preventing saving. I'm giving up for now. I thought of something to try after my last post. I did a batchexport on the Minotaur then ran "ucc make" on it and it worked. That tells me that I'm doing the ucc part correctly and that it has permission to write to the folder. No resolution yet but at least that eliminated two possibilities. The next step in the "ucc make" process was exporting so that kind of jives with the save thing. I might just try to extend the Goliath instead of subclassing... maybe. That "Error opening file" error is a problem while saving a package file. Make sure you don't have the package to compile open in any other program. To figure that out, you can use Process Explorer's "Find Handle or DLL" feature. Just enter the file name (i.e. GoliathII.u) and it should list you all processes currently referring to that file name. Yeah I realized that while lying in bed last night after I wrote it. It was late. Process Monitor is cool. Thanks for that. Unfortunately it shows zero matches. I also restarted my machine just to be sure and ran ucc make before doing anything else. The log says that it failed to load 'GoliathII.u'. There is no GoliathII.u, that's what I'm trying to create. When I did this with the Minotaur I deleted the Omnitaur.u file from my system directory and it created a new one ( I haven't tested it though by putting it in a map) so I thought it would do that same for GoliathII. Interesting. Oh well, since you've confirmed it's a saving error I'll keep trying. Log: Success: Compiled 1039 line(s), 137 statement(s). Ah yes, package saving is always a two-step process. First a temporary file is created (seems like that's what fails), then it is moved to the final folder and name. It works fine on the Mino. Weird. Log: Success: Compiled 1311 line(s), 150 statement(s). I'll try some more tonight. Turbo, I'm giving up on this for a while. Have you tried to figure it out? I think the Goliath from the FlyManta map will work fine for Gunshop. I tried it again and I guess what I thought was the shot being off was just me testing in 3rd person view. I almost never drive a tank with that view. It works pretty much like you would expect it to for a longer range, more accurate Goliath with better zoom. The shots seem just very slightly a tiny bit off to the left but considering how bad the stock Goliath is I don't think anyone will notice. Do you have a link to it? I probably won't have time to figure it out myself. I've made some progress on this. I got it to create the .u file. I basically made the same changes as on the LongRange version but I renamed it. I'm still working on the range though, trying to find the right value there. It's done with the lifespan so combine that with the speed and that gives the range (I think). I wish it was in actual distance instead. I'm not sure how to calculate speed*lifespan=uu. I think I also want to up the speed of the shot like in the LongRange version. It seems to take a long time to get there when you are zoomed in further and it travels further. I've also got the Minigun to pitch straight up so Raptors can't get in a spot where you can't hit them while they chew you up. For some reason my shots are off just a little to the left like on the LongRange version. I don't get that. The spread is set to zero so it must be something else. Ok, can't resist. Since you brought it up! How about removing the minigun turret and adding homing rockets? Like, the Leviathan primary rockets? No, those are way too spammy and don't take skill to use.